Source: Joseph Ames, Typographical antiquities: an historical account of printing in England, with some memoirs of our antient printers, and a register of the books printed by them, from 1471 to 1600, with an appendix concerning printing in Scotland and Ireland. Greatly enlarged by Rev. Thomas Frognall Dibdin. Volume II. (London: For William Miller by W. Bulmer and Co., 1812), pp. 250-253. W. H. Davenport Adams provided these handy Latin translations for those of us who were unable to take a course of study in this ancient tongue. 1. Quot estis in convivio. = Ye who are now at the feast. 2. 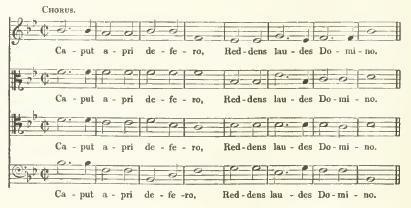 Caput Apri defero | Reddens laudes Domino. - I bring the boar's head, returning praise to the Lord. 3. Let us servire cantico. = Let us serve it with a song. 4. In Reginensi Atrio. = In the Queen's Hall. Translations from W. H. Davenport Adams, Round About Our Coal Fire (London: James Blackwood, no date; "1860" written in pen, and the date of the Preface), p. 163. Sheet Music from William Wallace Fyfe, Christmas: It's Customs And Carols (London: James Blackwood, 1863), pp. 175-176. Sheet Music from John Richard Magrath, The Queen's College. Vol. 2 of 2 (1341-1646) (Oxford at the Clarendon Press, 1921), pp. 240-241. 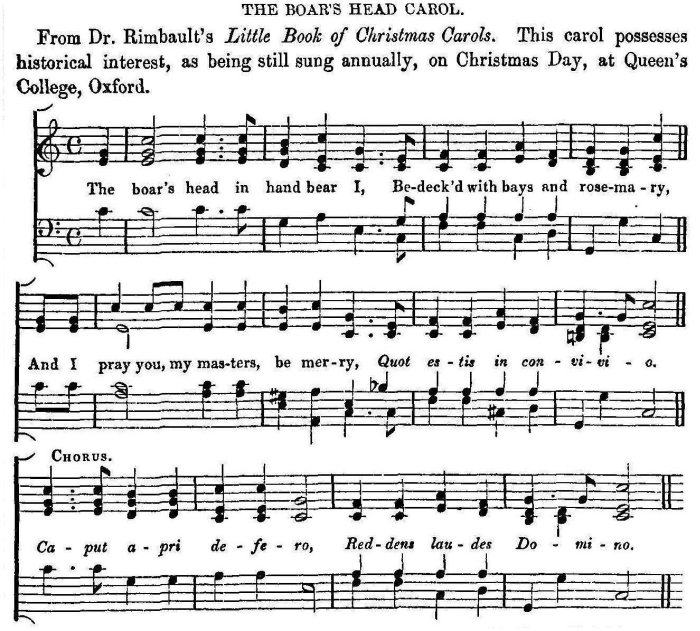 Source: Christmas Carols, William Chappell, The Ballad Literature and Popular Music of the Olden Time. (London: Chappell & Co., 1859), pp. 750-758. 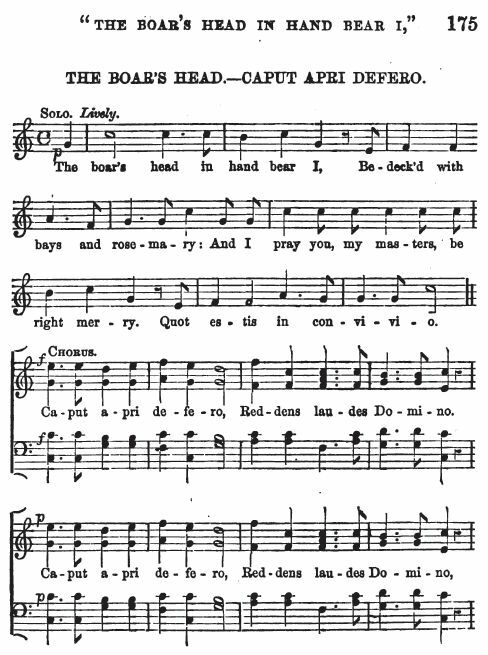 "Being anxious to obtain a correct copy of this ballad, as I had myself heard it sung in the hall of Queen's College, I wrote to the Reverend Mr. Dickinson, tutor of the College, to favour me with an account of it: his answer, which may gratify the curious, is here subjoined. Queen's College, June 7th, 1811. 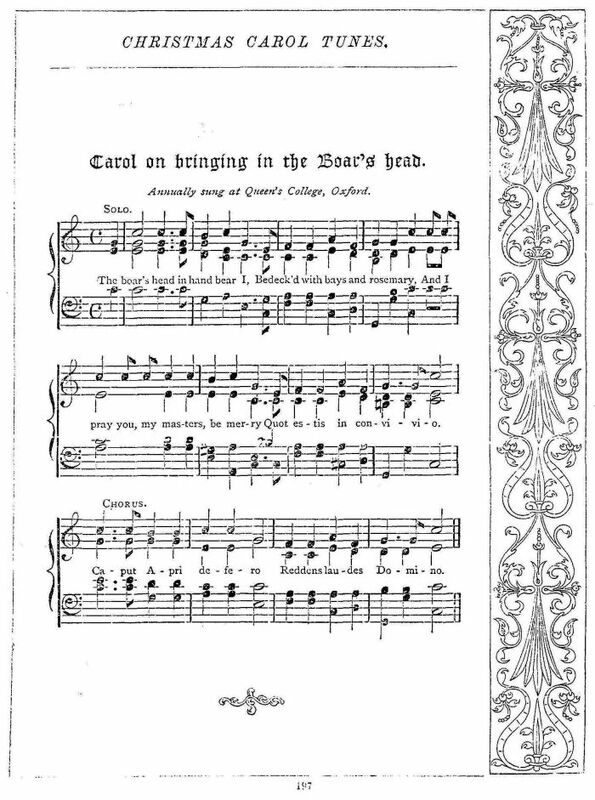 I have much pleasure in transmitting you a copy of the old Boar's Head Song, as it has been sung in our College-Hall every Christmas-day, within my remembrance. There are some barbarisms in it, which seem to betoken its antiquity. 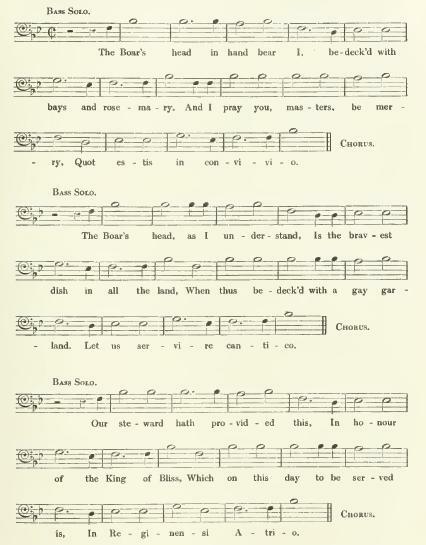 It is sung to the common chaunt of the prose version of the Psalms in Cathedrals; at least, whenever I have attended the service at Magdalen or New College Chapels, I have heard the Boar's Head strain continually recurring in the Psalms. The text given by the Rev. Dickenson is reproduced above. From several sources, I found that "R. Dickinson," was Robert Dickinson. In brief: Rev Robert Dickinson (1769-1847) Age 61: born 12th August 1769 at Lyth, Westmoreland; Queen's College, Oxford: matriculated 1786 (aged 16), BA 1791, MA 1795, Fellow and tutor; Rector of Headley 1818-1847; died 1st November 1847 at Cheshunt, Herts. Source: John Owen Smith, One Monday In November (2002), p. 100. Richard Leighton Greene, The Early English Carols (Oxford at the Clarendon Press, 1932), Carol #132C b., p. 92. 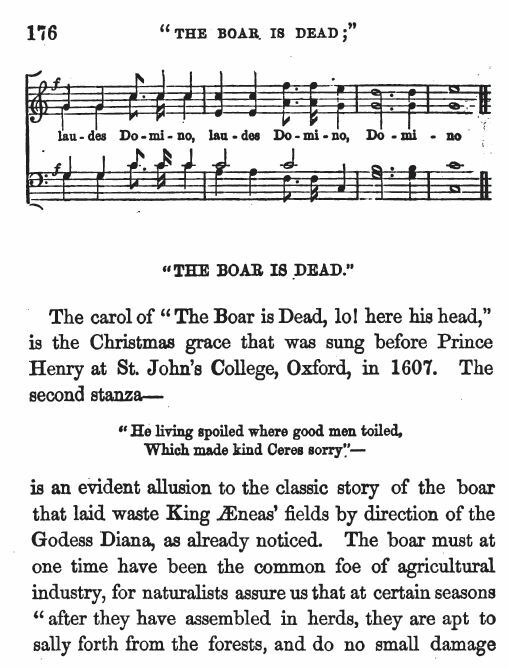 His valuable notes are found on The Boar's Head in Hand Bear I - Queen's College, 1921. William Wallace Fyfe, Christmas: It's Customs And Carols (London: James Blackwood, 1863), pp. 175-176.